Our everyday life contains many different kinds of meetings with colleagues and interactions with customers. In this world of global, multicultural business the art of creating good relations, working together, and using effective communication practices is more important than ever before. One of the main issues with teamwork and leadership is that we often tend to communicate with others in the way ‘we’ prefer to communicate, instead of adapting our approach to the people we are interacting with. This creates misunderstandings with customers, unnecessary conflicts with colleagues, and complicates achieving mutual goals. 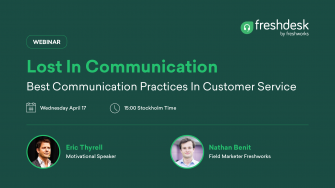 In this webinar, Eric Thyrell will provide insights and proven techniques that can help you become a better and more likable teamplayer and leader in customer service.